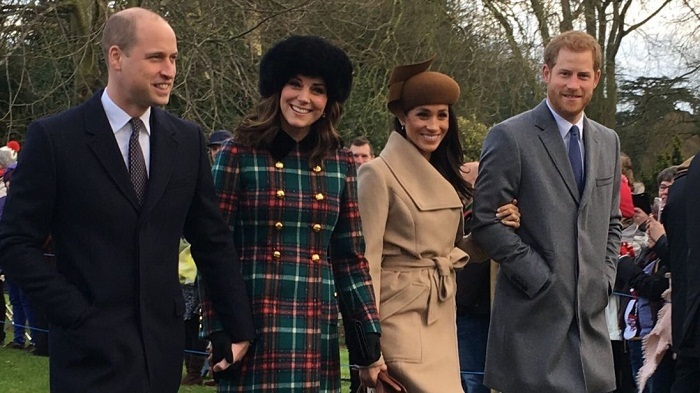 Prince Harry's fiancee Meghan Markle has joined the Royal Family for the Christmas Day service at the Queen's Norfolk estate. The couple arrived at a carol service at St Mary Magdalene Church in Sandringham along with the Duke and Duchess of Cambridge. The Queen returned after missing last year's service due to a heavy cold. Princes Philip and Charles and the Duchess of Cornwall also attended, along with other members of the family. After the service, Markle joined members of the family in greeting the crowds - some of whom had been waiting outside since 05:00 GMT. If royal tradition from previous years was followed, the family will have exchanged presents on Christmas Eve and awoken to a stocking of small gifts and fruit at the end of their beds. The Queen and Prince Phillip also attended an early Holy Communion service at the church. They will return home for a traditional turkey lunch, before watching the Queen's speech together. This year, the Queen will pay tribute to London and Manchester for the manner in which they dealt with this year's terror attacks, as well as praising the Duke of Edinburgh for his support in the year of the couple's 70th wedding anniversary. Meghan Markle arrived at the church on the Sandringham Estate looking every inch the future royal. She walked along in the heart of her new family between her fiance Prince Harry and the Duke and Duchess of Cambridge. She smiled at the crowd, which in some places, was five deep, some of whom had queued from 2.40am to be a part of the royal Christmas celebrations. When they left church, Meghan and Harry walked over to a couple of ladies who had been waiting. Meghan smiled as Prince Harry complimented them on their Christmassy coloured clothes and told them the royal children were so excited it was hard to keep them under control. The Americans in the crowd were especially thrilled to see her, mainly from the bases at Mildenhall and Lakenheath, happy at the prospect of one of their compatriots marrying into a British institution in May next year. One was so excited that he brought an engagement ring all the way from Wisconsin for his girlfriend and proposed to her in the queue. She said yes! A crowd of around 200 were waiting for the family's arrival from early morning. A number of Americans from nearby RAF Lakenheath made the journey to see the family and their new addition. Lindsey Wells, from Nebraska, said it was "intriguing" and "exciting" that Markle was marrying into the Royal Family, and she wanted to see them in person. For one couple from Texas the wait outside the church took on extra significance. Michael Metz proposed to girlfriend Ashley Millican - and she accepted. Miss Millican told the Press Association: "I had no idea. I was definitely very surprised. I never thought he would ask me right before we were about to see the Royal Family for the first time!" Metz added: "It was pretty tough to keep secret as I was so excited. It's memories to cherish forever."